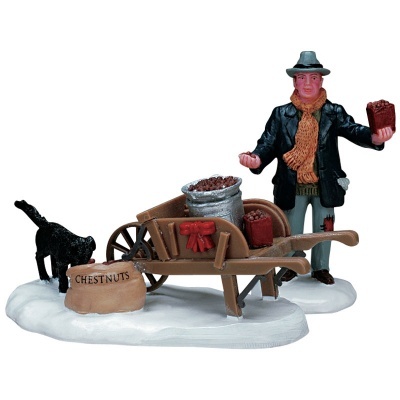 Lemax Roasted Chestnut Vendor Figurines (Set of 2) depicts a Winter street vendor selling roasted chestnuts from his wooden barrow, whilst a dog sneeks a bite! Lemax Roasted Chestnut Vendor set is suitable for placement in and amongst a Lemax village miniatures scene. An extremely popular Lemax Caddington Village Winter themed figurine set which joined the Lemax collection in 2007. Roasted Chestnut Vendor set comprises two delightful individual hand painted polyresin pieces on two snowed bases to compliment your seasonal Lemax Christmas Village.